Killing Eve has been taking America and the UK by storm for its unmatched storyline. If you want to watch anywhere else in the world you’ve probably been struggling to find somewhere to watch it. While Killing Eve has been shown in America and the UK it hasn’t yet made it’s way to other countries. Viewers in Canada, Australia and elsewhere have been calling out for ways to watch locally but it hasn’t yet happened. So I’ve put together this guide to show you how you can watch Killing Eve in any country. If you want to watch Killing Eve in Canada, Australia, New Zealand, Thailand, Japan or anywhere else then this is the guide for you. Below I’ll show you how by using a simple app known as a ‘VPN‘ you can watch the entire series of Killing Eve anywhere in the world. To watch Killing Eve you’ll need to get yourself a VPN app. A VPN lets you change your online location to appear somewhere else. The entire series of Killing Eve is available to watch on the UK’s BBC iPlayer service. By using a VPN you can access the usually geo-restricted BBC iPlayer service and watch Killing Eve in any country. There are however hundreds of VPN service providers and not all are suitable for watching BBC iPlayer so you’ll need to be a little bit savvy when choosing. I’ve been using ExpressVPN to watch Killing Eve because I find them to be the easiest and most reliable. They also have a really handy 30-day money back guarantee just in case you’re a little apprehensive that it may not work. There are other suitable providers too and below I’ve listed three of the best of them. It doesn’t matter too much which of the three above you choose but my recommendation is ExpressVPN. Click on one of the above providers and sign up for their service then read the steps below that show you how easy it is to use the VPN to watch Killing Eve in your country. Now you’ve got a VPN service you’ll want to know how you can use it to watch Killing Eve. Don’t worry, the process is really easy and even if you’re a novice with technology you’ll still be able to follow these steps. 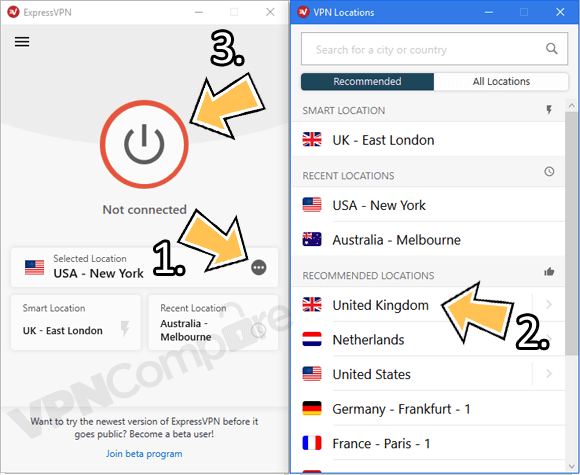 In my example I’m using ExpressVPN but you can modify the steps to use with any provider, they all work essentially the same. Just skip the first step if you’ve already signed up for one of the providers above. Visit ExpressVPN and sign up for their service. It’s cheapest to take their 12-month package, 49% cheaper than paying monthly. Download their app from the ‘Products’ section of their website. They work with Android, Apple iOS, Windows, Mac OS & the Amazon Fire TV devices. Open the app and login when needed. Press the Choose Location (1) button and then press United Kingdom (2). Wait for the app to automatically connect or press Connect (3) if it doesn’t. Once connected visit BBC iPlayer’s Killing Eve page or open their app. Watch Killing Eve with ExpressVPN. Now you’re connected to the VPN app from my recommended provider ExpressVPN or one of the other 3 I listed above any websites or apps you use will assume you’re in the UK. This allows you to unblock and watch Killing Eve in any country. So you’re now free to watch Killing Eve in Australia, Canada, Japan, Thailand, South Africa or anywhere else on earth! Don’t forget you can also watch other shows on BBC iPlayer so it’s worth having a look around to see what else you can use your VPN service for. Killing Eve is a brand new British drama series produced for BBC America. Based on the series of books Codename Villanelle it follows a bored MI5 officer tasked with tracking an assassin. Stars of the show include Sandra Oh and Jodie Comer. Oh and Killing Eve creator Phoebe Waller-Bridge were both recently nominated for Emmy awards such was the popularity of the show when it aired in America. The show has received critical acclaim around the world and holds a score of 97% on RottenTomatoes with an impress 88% “liked it” rating from readers. You can watch the entire first series right now and a second series is scheduled to be in production. To watch Killing Eve online in any country you’ll need to get yourself a VPN app. These are sold by many different companies but I recommend ExpressVPN. In my tests they worked the best and they’ve got a 30-day money back guarantee if you can’t get it working. Click the button below to visit their website and sign up for their service. Their 12-month package works out 49% cheaper than paying on a monthly basis and comes with 3-months free. If you want to watch others shows then it’s well worth considering. Once you’ve signed up download their app and connect to the UK. You can then watch the entire Killing Eve series online from anywhere in the world. Now you’ve started watching Killing Eve what has been your favourite part of the show? Let me know in the comments section below as I would love to know.